Saturday, August 4th, 2018. 6:00 PM. Hot, sweltering, Souther Californian heat. Waiting in line outside Grauman's Egyptian Theater on Hollywood Boulevard for an event set to fill a room with several hundred people. This is THE MEG-A-THON. In the lobby, a large standing cutout for The Meg so patrons can commemorate the prehistoric beast with photos, and two pairs of 3D glasses being handed out for separate showings. The Meg was the first showing and required more modern glasses, while Jaws 3D brought it back to the old school 3D glasses from yesteryear. A perfect reminder of the journey the format has taken in the last few decades. Prior to lights down, we got to watch footage of shark related media, including a clip of Fonzie doing his infamous jump on Happy Days and something I'm unfamiliar with called Jabberjaw. From what I could make out, Jabberjaw was Hannah-Barbera's attempts at recreating the magic of Scooby Doo, but instead of a mystery team, it revolves around a musical band and talking pet shark? Must investigate further. Before the show began, the audience got to take place in a Q&A that not only put people in the appropriate mood for six hours of shark movie goodness, but ended with a showering of beach balls and giant inflatable beach snacks. It was a good opening that would swiftly be followed by one of the most entertaining marathons I've had the pleasure of going to. Opening with The Meg (full review here) at 7:30 PM, the audience took full advantage of the amplified excitement by matching the surround sound with cheers and hollers. Even Rainn Wilson's character seemed to cheer alongside the audience whenever Jason Statham did something badass. Statham being badass happens frequently, by the way. Sadly, the only thing truly holding back The Meg was the darker 3D presentation. It wasn't terrible but as The Meg is a summer movie often shot in bright sunny light, the contrasting darkness feels like a misstep. None of this stops it from being an utter delight with a crowd. See it soon and see it large. Up next: Jaws 3D at 10:00 PM. Notoriously not great, so I opted to grab some food across the street during the opening segment. This makes me a fool because I missed Leah Thompson introducing the film to rousing cheers and welcomes (courtesy of other marathon patrons on twitter). Every other shot in the film revolves around pointy objects to showcase the 3D format, of which is unfortunately a strain on the eyes for long periods of time. The movie itself isn't even too bad, especially with packed house. Countless moments of stilted acting, flawed 3D presentation (the film's problem, not the theater's) and unintentionally funny cuts make it memorable enough. The problem is these fleeting moments of entertainment come only in short bursts. Jaws 3D is merely a passive viewing experience, to the point where you could feel the energy leaving the room whenever something like this wasn't on screen. If you ever have to watch Jaws 3D, watch it with a crowd. Last but certainly not least: Deep Blue Sea at Midnight. The Citizen Kane of dumb shark movies, Renny Harlin's b-movie opus remains as entertaining as ever. Sadly, it would seem that Jaws 3D was far too draining for a middle chapter of THE MEG-A-THON and the majority of the audience left as we approached Sunday morning. On the other hand, you could hardly tell the difference as the remainder of us kept up the momentum with every single mean-spirited, visceral kill. "I don't want to die!" screams a terrified scientist. Like any of these people had a choice. Smart sharks were our gods. Our hats were like shark fins. LL Cool J remains immortal. 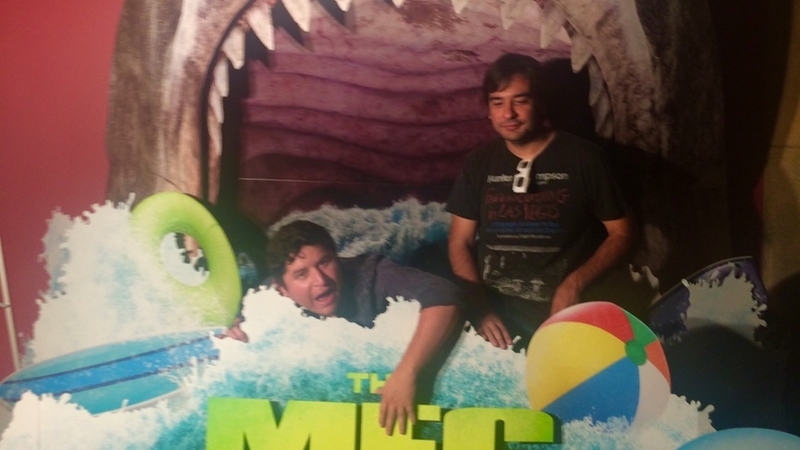 While I wouldn't end up calling The Meg the movie of the summer by any means, it did lead to one of the best theater experiences I've had in a long time. Long live THE MEG-A-THON. Looking back at Edgar Wright's breakout zom-rom-com hit.